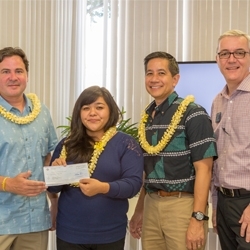 Honolulu, HI, March 23, 2017 --(PR.com)-- The Hawaii Affiliates of Sotheby’s International Realty (HASIR) Charitable Fund at Hawaii Community Foundation (HCF) made a presentation to the fund’s 2017 grant recipient, Hawaii Literacy, on Friday March 10th at the Kahala office of LIST Sotheby’s International Realty, 4211 Waialae Avenue, Suite 100 in Honolulu. Hawaii Literacy is the state’s leading non-profit provider of free literacy and education services, offering 1-on-1 adult literacy tutoring, family libraries and after-school programs at Kuhio Park Towers and Mayor Wright Homes, English language classes, and a Bookmobile that serves low-income communities along the Waianae coast. Since 1971, Hawaii Literacy has trained and equipped volunteer literacy tutors to help others learn to read. Each year, over 3,000 people across Oahu, Kauai, and Hawaii Island work to build the basic literacy skills they need to fill out a job application, read a book, help their kids with homework, and more! For more information or to get involved, please visit: http://www.hawaiiliteracy.org. LIST Sotheby's International Realty, Island Sotheby's International Realty, MacArthur Sotheby's International Realty, Oceanfront Sotheby's International Realty.